Goldbugs are bemused by reports that the European Union competition watchdog is investigating alleged ‘anti-competitive behavior’ by participants in the precious metals market. But anybody who remembers how the EU broke up the cement cartel a couple of decades ago will know that this is a watchdog that has very powerful teeth. It’s fines can bankrupt even very large companies or banks. True the goldbugs have watched and waited in the past when various investigations into alleged precious metal price fixing have been launched in the US, UK and Germany. These investigations have quietly concluded that nothing was wrong, despite some very convincing evidence from market watchers and industry experts. Market watchers help investors to decide the right time for all the financial transactions. But sometimes even the expert market watchers fail to give the correct analysis. This is where the professional systems like Crypto Code come into the picture. Please feel free to refer to Crypto Code review for further details. The general view in the gold community is that the central banks themselves manipulate the gold price to help dampen inflation expectations. And the central banks are above the law in such matters. However, they may have met their match in the EU competition watchdog. According to the Treaty of Rome and its later additions, EU law is the supreme authority, and even central banks are subservient to its law. The European Union is particularly strong on maintaining a level playing field in terms of business competition and market pricing. There was a time big cement firms thought they were above EU law, until one day investigators turned up first thing in the morning to seize documents and take away computers. After rather a short period of time the huge fines were made, hundreds of millions of dollars that really hurt profits. The cement cartel collapsed and prices fell, and so did their share prices. Could the bullion banks be the next to get that knock on the door early one morning? 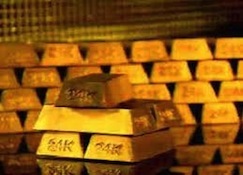 The EU investigators could do worse than start by reading back pages of the zerohedge.com website which regularly documents the false trades used to depress gold prices that are so blatant a blind man in a coal cellar could see them. Why are these trades initiated? Who does it? On who’s orders are they operating? What is the benefit to them of these blatant price manipulations. These are a few of the awkward questions the EU competition guys might like to put to those few players who count in the precious metals market. Could this be another cement cartel for them to bust? Why not? It is just as obvious.